They are now appealing to the public for any information that will help its return. 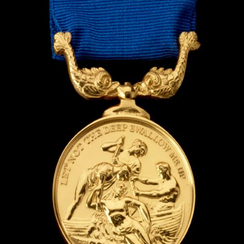 The gold gallantry medal, which is the highest award for bravery issued by the RNLI, is one of the most precious artefacts in the RNLI's heritage collection. It was recently found to be missing from a dedicated secure facility at the charity's head office in Poole. Despite an extensive search the medal has not been found and Police have been notified of a suspected theft. The Solomon Browne, sank after going to the aid of the coaster Union Star on the night of 19 December 1981. All eight volunteer crew members were lost in the disaster, and the whole crew were awarded gallantry medals by the RNLI in recognition of their selfless bravery and sacrifice. George Rawlinson, Operations Director of the RNLI, says: 'We are devastated by the loss of this important part of our heritage. "Not only is the medal of historical significance to the RNLI, it also has huge emotional importance, particularly to the families of the crew members who perished and the local community in Newlyn. "The medal represents the great courage, commitment and ultimate sacrifice made by the Penlee lifeboat crew. "To us, it is irreplaceable - our primary concern is to secure the return of the medal." The medal was stored in a facility with multiple layers of security. A thorough search of the heritage collection and an internal investigation has been carried out. The RNLI is now working closely with the Police and those affected by the medal's loss.